Linda Sue Park just hit another one out of the ballpark. Watch for this book. It’s due out from Clarion in March, and I predict It’s going to win awards. Keeping Score is the very best kind of historical novel – one that first introduces kids to funny, dynamic characters they’ll love and then brings in historical elements that are so much more meaningful as they affect the lives of those characters. Ten-year-old Maggie Fortini loves the Brooklyn Dodgers. Loves them with a big, fat capital L. When Jim, a pal at her dad’s firehouse, teaches her how to keep score, she finds a way to be an even better fan and believes she’s helping the team when she keeps track of every play. But as Maggie cheers the Dodgers in the early 1950s, the Korean conflict rages overseas. The war that isn’t called a war comes crashing into Maggie’s life when her friend Jim is drafted and suddenly stops communicating with her. She would walk past the row of houses that looked just like hers, all built of dull brownish-yellow brick, one window downstairs, two windows up – to Pinky the butcher, or Mr. And Mrs. Floyd at the bakery, or the drugstore, and she wouldn’t miss a single pitch. Everyone would have their radios on, the sound of the game trailing in and out of each doorway like a long thread that tied the whole neighborhood together. Keeping Score does for the Korean War what Gary Schmidt’s The Wednesday Wars does for Vietnam – contextualizes it through a funny, poignant story of life on the home front, told from a young person’s point of view. This is a perfect book for baseball fans, so Clarion’s plans to roll it out in time for the first pitch make perfect sense. But you don’t have to be a baseball fan to love this one. Like so many great kids’ books, baseball may be the hook, but there’s so much more here. Keeping Score is full of colorful characters, like George at the firehouse, who shares his roast beef sandwiches with Maggie, her dad, who worries about crowd control, and her mom, who prays for the Dodgers while she knits. It’s about baseball, but it’s also about family and friends and war. Most, though, Keeping Score is about holding on to hope – something that old-time Dodgers fans knew all about.
! I loved this book almost as much as Maggie loves the Dodgers! 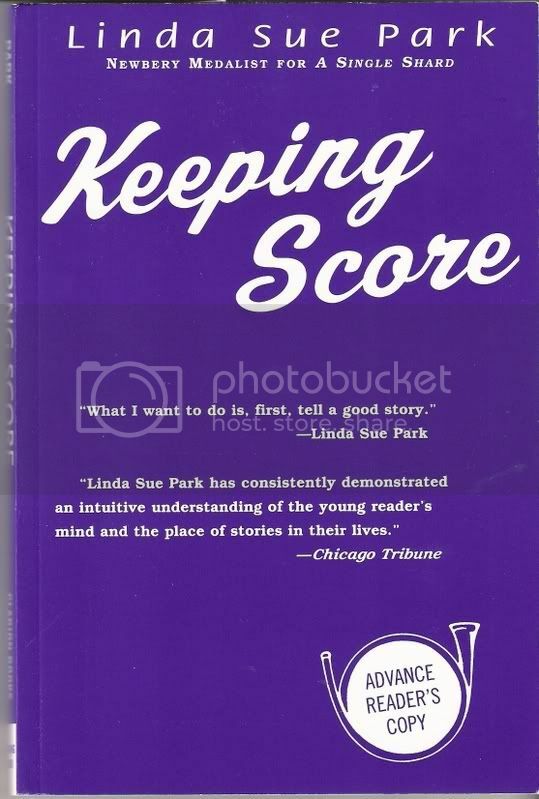 This entry was posted in Uncategorized and tagged book reviews, keeping score, linda sue park, middle grade fiction. Bookmark the permalink. Both comments and trackbacks are currently closed.